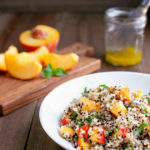 Sometimes you need quick and easy and this citrus quinoa salad fits the bill. Plus, it’s healthy and is a great side dish for those summer picnics. The citrus dressing adds some zip and ripe peaches adds some sweetness. It’s all good stuff but what’s really intriguing about the recipe is the cooking technique for the quinoa. After the quinoa is cooked and drained, it gets a quick steaming. This extra step dries out the quinoa and gives it a nice fluffy texture – no mushy quinoa here. It’s the perfect backdrop to let the dressing shine through. I decided to add peaches to this salad because we are taking advantage of peak peach season right now. We were lucky enough to pick up a case of amazing peaches at a roadside stand near Austin a couple of weeks ago that were the best ones we have found all summer. If you can’t find good peaches, you can substitute with other ripe stone fruits or orange segments that have been supremed. I’m keeping today’s post short. I’m in California visiting my sisters and busy planning meals to cook that I can freeze for them to enjoy for the next several weeks. It’s how I express my love. In a medium bowl, soak the quinoa in cold water for 2 minutes. Drain the quinoa in a sieve (one that will fit over a 4-quart saucepan) and rinse well. Bring a 4-quart saucepan of well-salted water to a boil. Add the quinoa and cook until almost tender, about 10 minutes. Drain quinoa well in the sieve. Add 1/4 to 1 inch water to the saucepan, checking to make sure the bottom of the sieve doesn’t touch the water. Bring water to a simmer then set the sieve in the pan. Cover with a lid (it’s fine if it doesn’t fit tightly), and steam until the quinoa is tender and feels dry, about 5 minutes. Remove from the heat and let stand, covered, for 5 minutes. Meanwhile, in a small bowl, combine the orange juice, lemon juice, and lemon zest. Slowly whisk in the oil, and season with a generous pinch each of salt and pepper. Transfer the quinoa to a large bowl, toss with the dressing and basil. Gently stir in the peaches and season to taste with salt and pepper. If you can’t find good peaches, you can substitute supremed orange segments instead. Recipe adapted from Fine Cooking, Aug/Sept 2016. This quinoa salad looks absolutely yummy! Gotta try make the dressing! Thanks, Julia! I do hope you get to try the dressing – it’s quite tasty.